Family Practitioner Ryan Fier, M.D., began practicing as the third full-time physician at Cuyuna Regional Medical Center’s Baxter Clinic in July 2016. He earned his Medical Degree at the University of Minnesota Medical School in Minneapolis. 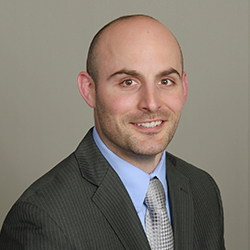 Dr. Fier came to the Brainerd Lakes from the Twin Cities where he served as Resident Physician and Chief Resident at St. Joseph’s Family Medicine Program since June 2013. He also earned a Bachelor of Science degree in engineering at South Dakota State University in Brookings. A member of the American Academy of Family Physicians, American Medical Association, Minnesota Academy of Family Physicians, and Minnesota Medical Association, Dr. Fier also practiced at Fairview’s Urgent Care in Minneapolis for two years. He also served as an emergency room, urgent care, and inpatient medicine physician and Swift County Hospital in Benson, completed an internship at Avera Medical Center in Marshall, youth counselor for the Sheriff’s Youth Program in Marshall, phlebotomist at Sanford Medical Center in Sioux Falls, and direct support professional for Advance in Brookings. Dr. Fier and his wife, Dr. Laura Fier who is an Internal Medicine resident with a focus on Medical/Pediatrics, have one son, Breyer. Outside of his practice, Dr. Fier enjoys time with his family, deer and pheasant hunting, running, golfing, hiking, biking, as well as water and snow skiing.